So, out of this pants-frustration, my love of skirts and dresses began. For this week of mini-labs, I thought, 'Hey! Let's try a week wearing what I like!' No definitive broken rules, just skirts and dresses all week. Fun, right? What could go wrong? It all started fine! I'd washed all my tights the night before, so Monday morning I pulled on my most comfortable pair. 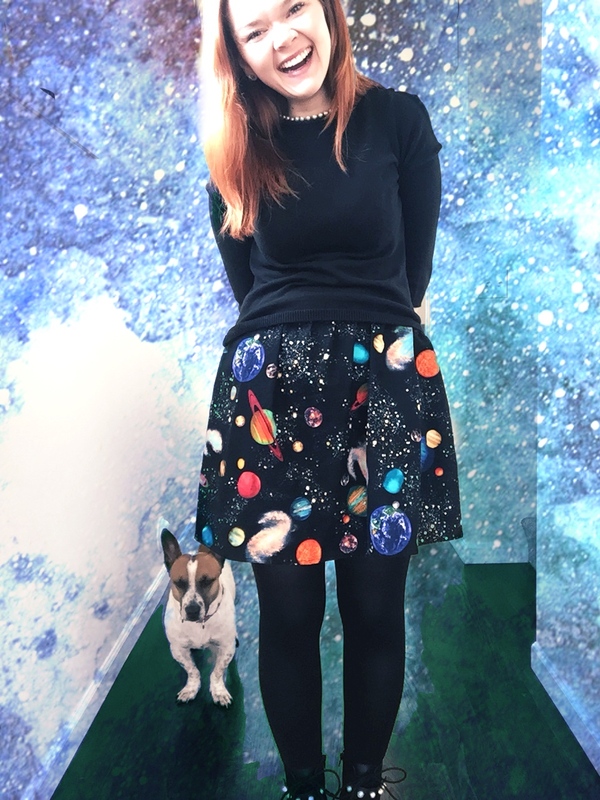 Fun was the goal of the week, so I added this planet-covered dress, and a black sweater with a sewn-in pearl collar. I finished the ensemble with black, pearl-covered, lace-up booties, and I was feeling pretty clever. I liked the juxtaposition of the more conservative pearl necklace with funkier pieces. Also, most importantly, none of the items were too restrictive, and that's a necessity the week after Thanksgiving. My schedule changed, and I ended working from home all day. While this outfit never went public, I enjoyed it nonetheless. So, day one, week without pants, a private success? You know the weather is gloomy when the best light we found all day was in a parking garage. This purple-olive green combo is one that I've never tried and I really liked it! In the end, this dress was just a bit too short for my inner old lady, but the whole combo did make me feel a little artsy (in a bookish way?) so, all in all, a successful day of no-pants fun. Also, Isabel Allende is wonderful, and if you haven't read her books or watched her Ted talks, I highly recommend them! Oh, Wednesdays. On Wednesday, I managed to come up with an outfit that I really liked, despite my Wednesday-based desire to stay in sweatpants and pout that it wasn't Friday. I love this star-print skirt, and I love it with stripes, and I really loved the skirt and the top with my avocado puffy jacket, and I loved wearing hi-tops all day the most. Plus, the whole outfit was cotton! It doesn't break any rules, but it still felt fun! I headed out for a work meeting, and then returned around midday. I took my lunch break to walk Izzy, and before we left I took off the skirt and put track pants over my tights. When we came home, I never put the skirt back on... I spent the rest of the day working at home wearing tights with sweats on top. Thus began my downhill slide. Nothing fixes a bad outfit like a Lowe's photo shoot. On Thursday, I did not want to wear tights. And I wasn't so-so about it - I didn't want to wear tights at a toddler-temper-tantrum level of not wanting to wear tights. I did. I wore the damn tights. But, also, my schedule kept changing and I ran out of the house in a rush, and well, the outfit was embarrassing. It was like I'd never, ever, experimented at all! It was a plain black shirt dress, the dreaded black tights, black booties, a green elephant infinity scarf that I wrapped around my neck so many times it looked like a neck brace, and a purple sweater. Snorezilla. To top it off, after I left the house I realized that my tights were covered in little micro-tears. All over. I felt a mess. There is one fire alarm in our house that we can't reach with a step stool, and on this particular Thursday, its battery decided to die. Christian and I ended our day at Lowe's buying a ladder and batteries, and some pho takeout. (The pho wasn't from Lowe's.) As soon as we got home, off the sad black outfit came, and out came the sweats. On Friday, I reached a new low. I was so fed up with tights, that I found Monday's more comfy pair in the laundry bin, washed them with hand soap in the sink, put them in the dryer, and then wore them. Embarrassing, and so very true. If Thursday was temper-tantrum level, Friday was.... worse. Much worse. I had a very busy workday, it was raining (per usual) and I didn't want to feel the breeze ANYMORE. I spent the whole day having a loud internal monologue about how I should just wear the damn pants if I wanted to, and why was I being so stubborn? Most of this angst sprang from the fact that we were going to see Trevor Noah that evening and wearing some fancy outfit to a comedy show felt lame. I didn't want to be lame! Who wants to be lame? I should just wear pants. Finally, I got over myself. I didn't wear pants (mostly because that would have meant peeling the tights off). I compromised and wore a denim shirt with a simple black skirt, and put on some red lipstick so I'd feel better. The lipstick helped. Walking to the train in the rain inhibited my shoe options, and I just accepted it. Better to wear simple shoes than ruin some of my favorites. And I wore that avocado puffer, again, because it's water repellant and warm, and again, rain. I broke no rules, but I was warm and appropriately dressed and had a lovely evening, nonetheless. If it's winter, wearing skirts all week probably won't be fun. Experimenting with no goal in mind is pretty useless. Sometimes weather and schedule dictate my outfit, and that's life. Most outfits (and moods!) can be saved with red lipstick. Now (finally!) back to breaking rules! See you on Tuesday! Character Study - November Favorites!